Many people don’t give their urine a second thought unless the smell or color is unusual. But those can usually be dismissed, too. After all, maybe you ate something different or didn’t drink enough water that day. When urine is pink, red or brown—that’s when people start to panic. More often than not, people see reddish colors in their urine and assume the worst about their health. The red color in your urine isn’t always a reason to fear! The color of your urine has much to do with your diet, fluid consumption, age and activity level. However, if you’re noticing blood in your urine it may be time to call your urologist. 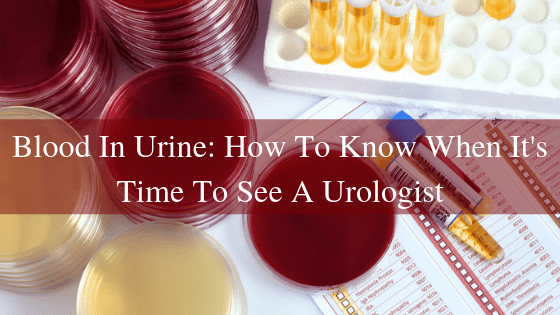 Before sending yourself into a frenzy, follow along with us below to see what might be causing the discoloration or blood in your urine—and learn when it’s time to schedule a urology appointment. Healthy urine can range in color throughout the day depending on its concentration. You may notice your urine is pale yellow in the morning and amber in the evening. This is completely normal and usually depends on how much water you consumed during the day! If your urine is clear, that is a result of drinking a lot of water! However, if your urine is white or murky, it could be a symptom of a urinary tract infection (UTI) or kidney stone. Dark yellow urine is usually a sign that you’re dehydrated and your body needs more water. This happens because your body needs a certain amount of fluid to function, so it will retain the fluid it needs, resulting in more concentrated and darker urine. While green urine can be a result of a UTI, it’s more common for patients who are on specific medications, or take Vitamin B daily. The green tint in urine may also be caused by your diet. For example, if you eat food with heavy amounts of green dye, your urine may look green as well! Similar to green urine, orange urine can also be caused by medications and diet. If you snack on carrots, or drink carrot juice throughout the day, chances are your urine will be orange too. Orange urine may also be a sign of something more serious. If you are experiencing orange urine with light-colored stools, it’s time to see your urologist. This could be an indication of an issue with your liver or bile duct, so schedule a urinalysis as soon as possible. If you find yourself eating lots of fava beans, aloe or rhubarb, you might experience brown-colored urine. Your urine may be brown if you have a liver or kidney disorder, or a UTI. Certain medications can also cause brown urine, so it’s always best to consult your urologist if you notice brown urine frequently. Pink or red urine seem to always cause alarm, and rightfully so! There are a few simple reasons why your urine may be pink or red though. Blackberries, rhubarb and beets are known to cause a reddish tint to urine. It’s so common in fact, that many have named it “beeturia”. Beeturia doesn’t happen to everyone, however. You’re more likely to experience it if you’ve eaten a large number of beets or it’s been a while in between meals. Red in your urine may be a sign of something more serious though. In fact, it only takes one drop of blood to color your urine entirely. With that being said, here are some causes for blood in your urine, followed by next steps for diagnosis and treatment. Intense exercise, especially in younger people, has been known to cause blood in urine. “Jogger’s Hematuria” is common in runners, and is usually caused by the friction between the walls of the bladder. To avoid this, some find that it’s best to run on a somewhat full bladder. You don’t want your bladder to be empty, and you don’t want it to be too full either. Having fluid in your bladder may help prevent friction, and help you avoid potential blood in your urine. A urinary tract infection or UTI is another common cause of blood in urine. A UTI is a genitourinary infection typically experienced in women (women are actually 10 times more likely to contract a UTI than men!). One of the most common UTI symptoms is dark-colored urine or urine that appears to have blood in it. A UTI is an infection, and will need to be treated by a urologist. If you think you have a UTI, don’t wait to make an appointment. Also, take a look at some ways to ease the discomfort from a UTI. Kidney stones are another culprit known to cause red urine. Not only are kidney stones extremely painful, but a rigid stone rubbing against the walls of your kidney can cause ongoing bleeding. If you notice blood in your urine, accompanied by severe pain in your kidneys, call your urologist immediately to discuss treatment options. While blood in urine is alarming, it’s definitely more cause for concern with older people—especially older men battling an enlarged prostate or prostate cancer. However, red urine isn’t always an indicator of prostate cancer. Rather, it could be a sign of inflammation in the prostate that can be treated with a trip to the urologist. While blood in urine is usually something that can be fixed with a round of antibiotics, it could be a sign of something more serious going on. It’s important to note that red urine could be a warning sign of prostate cancer, kidney cancer or bladder cancer. While each of these has their own set of symptoms, it’s crucial to rule these diagnoses out with a urinalysis, especially if you are older. If you notice blood, or even a reddish color in your urine, the best thing to do is to schedule an appointment with your urologist. A urinalysis is a quick way to determine if the red color in your urine is harmless or a cause for concern. If you are younger and extremely active, you may be safe to wait it out and see if the blood is ongoing or a one-time occurrence. However, if you are older, we recommend getting the discoloration checked sooner than later. If you experience red urine, it may be hard to tell if it’s from simply eating too many beets or if it’s an indicator of something more serious. Instead of wondering, make an appointment with one of our board certified urologists at Urology Specialists of the Carolinas. We will be able to ease your mind quickly and painlessly with a simple urinalysis. Once we have the results, we can either assure you everything is normal, or begin to discuss potential treatment options if necessary. We promise to educate you, listen to you and guide you through treatments, all while helping you maintain a healthy lifestyle. For more information about health and nutrition, download our free Nutrition and Lifestyle Guide below.